I love ravens – especially watching all their acrobatics. The sound you describe is what I’ve mostly experienced from griffon vultures flying close by. 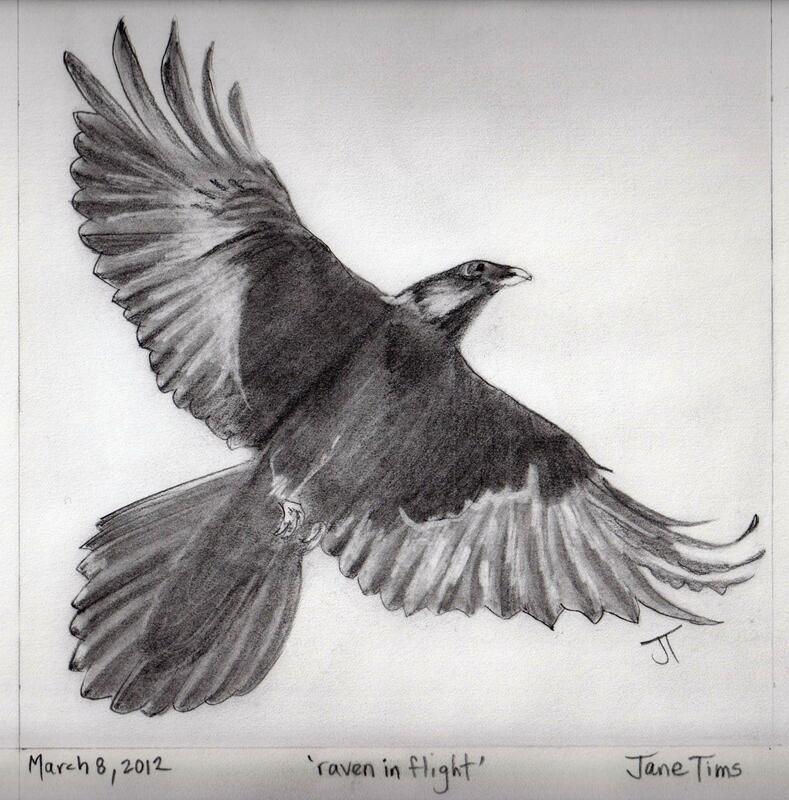 The drawing certainly feels like the raven is flying right overhead. Percussion of dragon wings, perfect. Thanks for this, Jane. I love the various vocalizations of Ravens, especially the one that sounds like the flexing of the bottom of vintage oil cans! Jane, I have heard that sound! It is marvelous! We live on a point that juts out over some low lying surrounding land. Great flocks of hundreds of large crows “power fly” over our back yard, and patio, often according to their own flocking rhythms. I’ve stood outside under hundreds of them flying just a few feet above me. It is truly a dragon-like sound. I used to think they were ravens, but later learned that ravens don’t flock. Thank you for this post! Beautifully succinct lines, fine imagery and great illustration. Lovely. Hi Jane, Your good drawing and haiku surely create a sense of what you are describing. The words and images (the one drawn and the one imagined) are sheer magic.